In common with other slipper lobsters, Ibacus peronii has a broad, flattened body and a large carapace. The carapace is reddish brown, and reaches lengths of 2–8 centimetres, with the whole animal able to reach a length of 23 cm and a width of 10–14 cm. The antennae are also short and broad, and the flattened form of the whole animal allows it to partly bury itself in soft substrates. There are no claws on the five pairs of legs. Captured animals typically weigh around 120 grams, but the weight can range from 80 to 200 g.
The species is sometimes confused with the Moreton Bay bug, Thenus orientalis, but they can be distinguished by the placement of the eyes: the eyes of I. peronii are near the midline, while those of T. orientalis are at the margin of the carapace. T. orientalis is known by a number of common names. The United Nations' Food and Agriculture Organization prefers the name flathead lobster, while the official Australian name is Bay lobster. In Australia, it is more widely known as the Moreton Bay bug after Moreton Bay, near Brisbane, Queensland. 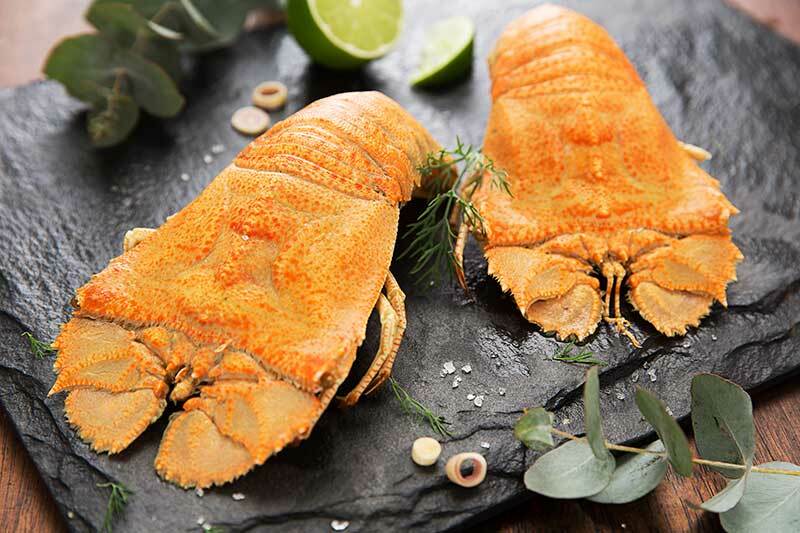 In Singapore, both the flathead lobster and true crayfish are called crayfish. They are used in many Singaporean dishes. The species is sometimes confused with the Balmain bug, Ibacus peronii, but they can be distinguished by the placement of the eyes: the eyes of I. peronii are near the midline, while those of T. orientalis are at the margin of the carapace. T. orientalis has a strongly depressed body, and grows to a maximum body length of 25 centimetres, or a carapace length of 8 cm.